Faster wireless speeds and improved application and graphics performance are on tap with the new Snapdragon. Premium mobile devices with brighter screens, better cameras and faster wireless connectivity powered by Qualcomm's new Snapdragon 820 chip could ship as early as April next year. High-end devices with the new chip will start contributing to Qualcomm's revenue in the second half of the company's financial 2016 year, said Steve Mollenkopf, CEO of the company, during an earnings call late Wednesday. That means volume shipments of smartphones and tablets with the chip could start in April, which is when the company's third financial quarter begins, said Jim McGregor, principal analyst at Tirias Research. No devices with Snapdragon 820 have yet been announced. Those could come as early as Mobile World Congress in late February, McGregor said. Snapdragon 820 will offer better graphics and application performance than predecessors. The 64-bit chip is based on Qualcomm's Kryo CPU and the Adreno 530 GPU, which is up to 40 percent faster than the older Adreno 430. An upgraded camera system will allow users to shoot sharper pictures. 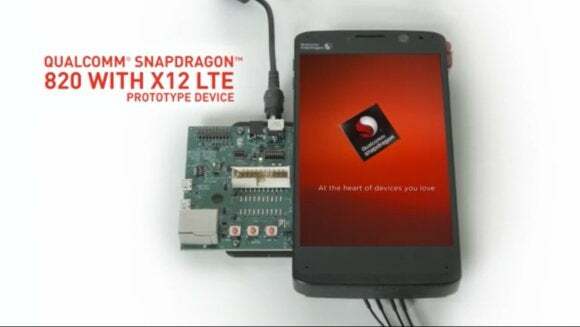 An integrated modem in the Snapdragon 820 will provide faster wireless and cellular bandwidth than earlier versions. Qualcomm claims the chip will have download speeds of up to 600Mbps (bits per second) and upload speeds of 150Mbps. The chip also supports LTE-U (LTE-Unlicensed), which expands LTE networks into Wi-Fi frequencies. Qualcomm has advertised the chip's artificial intelligence abilities, with some features drawn from the company's Zeroth neural chip. Mobile devices using the chip will be able to track user behavior and tweak features on the smartphone based on usage patterns, the company has said. With Snapdragon 820, Qualcomm will close the curtain on the older 810 chip, which has been considered a failure. Samsung dropped the Snapdragon 810 from its Galaxy S6 smartphone primarily due to overheating issues. There are 60 prototype devices being tested with the Snapdragon 820 chip, Mollenkopf said. It isn't clear yet how many of those devices would be commercially released or if any of them would be a high-volume product.